Yesterday bears pushed down the price and the daily close was 1.1649. Now we pay attention for the monthly price close and after that we will choose the price direction for EURUSD. 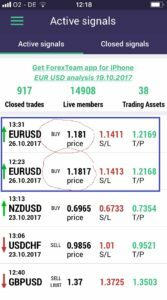 ForexTeam traders expect bulls pressure for the currency pair EUR USD with first Take-profit target on 1.1904 – 1.1910. This bulls pressure will be alive till the daily close price below price level 1.1732.